I arrived in my hotel room at the beginning of our travels with a very clunky dell laptop, and a dial up internet connection that was both unreliable and hugely expensive. These were the days when you thought of everything you needed to do online before you dialed up, as you were charged by the minute. Someone forgot to tell me that bit. I left the hotel two months later with an internet bill that G and I have just pretended never happened. It’s better that way. In January 2000, there was no Facebook, no Skype, no cheap apps for getting free calls. We didn’t text through pictures, we didn’t Instagram, an update was something that happened in the news. Being an expat, used to be a much more isolated gig. This weekend a girlfriend of mine flew to Dubai to meet with a group of fellow students that she’ll be studying along side this year. The University she will be “attending” is in the UK, her classmates are from all over the world but at this point in time they find themselves in the Middle East. What did we do before online study? I can still remember the panic of friends when study materials didn’t arrive in the post, the assignment that was lost in transit. This weekend I attended a blogging conference. 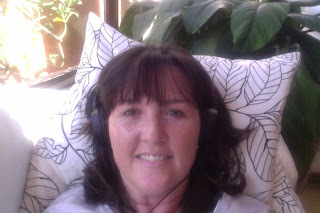 The conference was in Melbourne, but I was wandering around my house with a goofy grin and a set of headphones in Qatar. For the grand total of $200 I listened in on every presentation, copied notes from slides that were presented, followed a tweet stream, and joined a Facebook group. I couldn’t have been more there without actually being there than I was. This is how the world is changing – and it rocks for women like me. Sure, it would have been great to have made eye contact with some of of my peers over the weekend, and yes I was insanely jealous when I saw pictures of women that I now class as friends standing side by side, but hey, I got to see the pictures! And although I wasn’t a part of the conversation, I was there, listening and learning. For years expats have struggled to pick up on certain points of pop culture. We’ve missed references or haven’t understood the punchline, but things are changing. Technology is on our side. For women who are traveling, the world is not just smaller it’s easier, our careers are more portable and our opportunities have expanded. This weekend I didn’t miss out.